For Immediate Release- Oklahoma City, Okla., (12-15-2016)- One of the most decorated National Reining Horse Association (NRHA) sires has done it again. This time, Wimpys Little Step can thank his 12 offspring in the 2016 NRHA Futurity Finals for helping him achieve his newest milestone, NRHA Nine Million Dollar Sire. At 17 years old, Wimpys Little Step is only the second sire to reach this status. 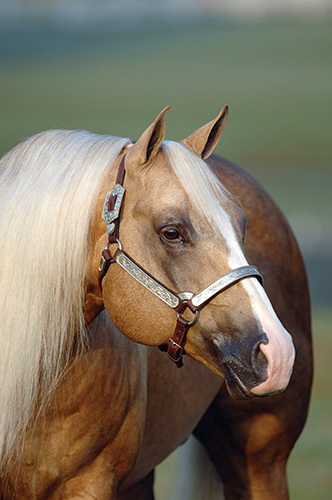 The palomino stallion, bred by Hilldale Farm, is owned by Xtra Quarter Horses, LLC of Purcell, Okla.
With several accolades in and out of the show pen, Wimpys Little Step is by NRHA’s newest Three Million Dollar Sire Nu Chex To Cash and out of Leolita Step. Wimpys Little Step took the reining world with Shawn Flarida by the reins, winning the 2002 All American Quarter Horse Congress Futurity and the NRHA Futurity in the same year. During the 2016 NRHA Futurity, with six offspring in the NRHA Non Pro Futurity Finals, one offspring of Wimpys Little Step took home a Non Pro Futurity Championship. Wimpys Little Jessie (out of Jessie Dot Tari) ridden by Taylor Zimmerman won the Level 1 Non Pro, in addition to placing third in the Level 3 Non Pro, seventh in the Level 4 Non Pro and third in the Level 2 Non Pro. Collectively Zimmerman and Wimpys Little Jessie took home an estimated $44,600. Altogether Wimpys Little Step’s 12 money earning offspring made over $106,810.00 in the 2016 NRHA Futurity Finals. NRHA welcomes Wimpys Little Step NRHA’s newest Nine Million Dollar Sire.